Jubilant HollisterStier’s Spokane facility offers two GEA 385 ft2 and two BOC Edwards 220 ft2 lyophilizers in the high-speed commercial filling suites. Jubilant HollisterStier’s Spokane facility offers two GEA 385 ft2 and two BOC Edwards 220 ft2 lyophilizers in the high-speed commercial filling suites. Automatic cold shelf loading and unloading, and clean in place and steam in place dehumidification systems are just some of the features that our large lyophilizers provide. For clinical trial products, a 30ft2 lyophilizer is available as well. Products that require loading onto pre-frozen shelves at temperatures as low as -45°C can be accommodated. 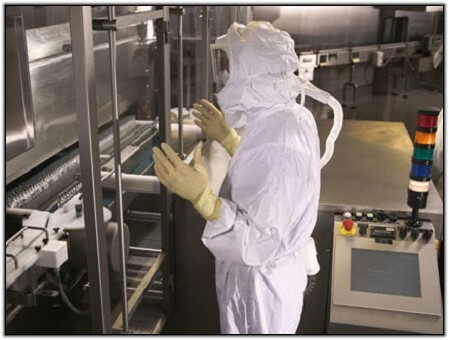 HollisterStier collaborated with our vendors to design a low humidity (down to 5% RH) and low temperature custom environment (10-12°C) in the vial loading area to eliminate concerns with frost build-up on the shelves. Dehumidification system designed by our expert engineers. Vials are processed and filled using Jubilant HollisterStier’s high-speed parenteral manufacturing lines. Upon filling and partial stoppering of the vials, they are automatically conveyed to a clean room complex under ISO5 (class 100) conditions. 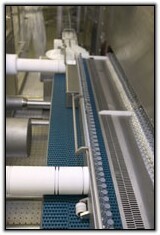 The automatic loading system on the lyophilizer then loads the vials at speeds up to 200 vials per minute. The vial sizes can range from 2mL to approximately 125mL. Vial capacity is dependent upon vial dimensions. The lyophilization suite at our Montreal facility is integrated into our high speed filling line. Robotic loading systems results in accelerated freezing time, minimized product degradation and reduced risk of microbial contamination. The Montreal suite houses two BOC/Edwards lyophilizers with production capacity of 374 ft2 of freeze-drying shelf space (120 and 254 ft2). Semi-automated inspection of vials for quality assurance is offered as well. Vial capacity is dependent upon vial dimensions. For further information regarding vial capacity, contact Jubilant HollisterStier at info@JHS.com.